The Super BANANA is for the stripped cables and The Spade BANANA is for the Spade lugs terminated cables. 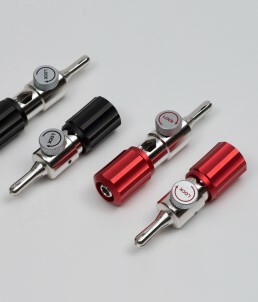 Each set contains 4 pcs (2 red and 2 Black) of plugs in the case. • Anodized hard aluminum clamp sleeve with good texture and advanced performance. • Ergonomics design enables to tighten the clamp sleeve lightly by hand. • Variable Contact Pin: The end of the contact pin opens by turning the contact pin adjust knob. This ensures solid contact with the pole terminal. • Banana plugs can be connected to each other. 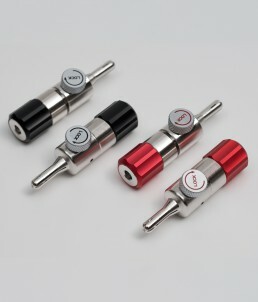 • Each set comes with two pieces of clampers to hold pair of plugs. • Packaged in a box with English instruction on the back side.